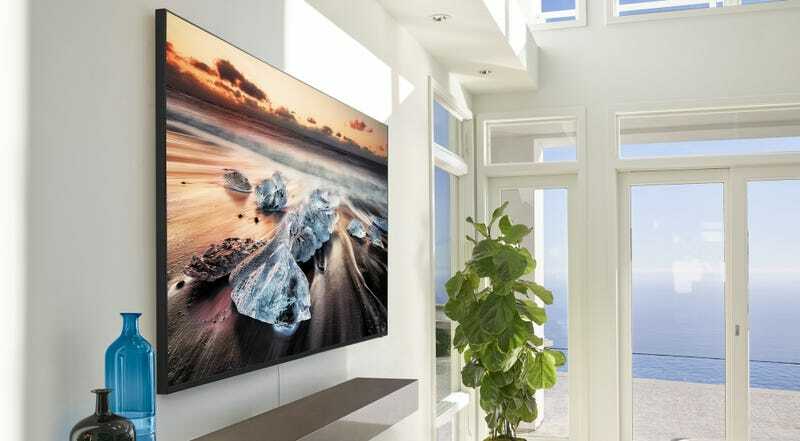 Most of the major TV makers, like LG and Sony, were eager to show off their enormous 8K sets in January, but if you were struck with TV envy, you were frustrated because no one at the show was willing to talk about how much over 33 million pixels would cost. But Samsung announced availability and pricing today for its 8K Q900 series—so prepare to spend $15,000 if you want 85-inches of 8K TV. At CES in January, Samsung gave me a look at the possibilities of its upscaler. In a controlled demo, in which Samsung supplied the 4K and lower resolution content it was upscaling, the 8K panel was impressive, but the real test will be trying to watch all the other stuff—like old TV shows upscaled from 480p, or a Netflix stream that’s gotten fuzzy because everyone in the neighborhood is eating up the bandwidth. We’ll have a better idea of how the TV handles all that when we review it. If you can’t wait, you can drop your $15,000 now. Though Samsung is selling it in multiple sizes—all of which are cheaper. The 82-inch version ships March 15 for $10,000, the 75-inch version ships March 1 for $7,000, and the 65-inch version ships March 1 for $5,000. That’s really expensive, but in fairness, the 65-inch version lands firmly in the very high end for a 4K 65-inch set. Whether 8K will be worth it (and I’ve heard good arguments both for and against it) remains to be seen. Also things that remain to be seen? The cost of the even larger 98-inch 8K set. It will hopefully arrive later this year and you can expect to spend around the same as a very affordable car.